If you are a consultant or contractor (i.e. agency hired by client) then bringing this type of data to your ongoing reports and roadmap discussions will create more meaningful (and accurate) discussions. 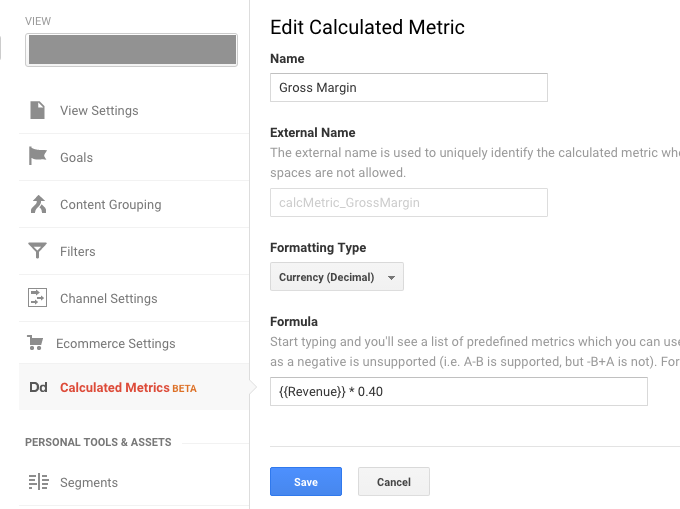 If you’re a business owner or responsible for company income and margin reporting, then you already know the potential value in having margin and profit data available in Google Analytics. Related Article: How to track net profit by SKU with paid search shopping costs. Gross Margin: Gross margin is your total sales revenue minus your cost of goods sold (COGS), divided by total sales revenue, and expressed as a percentage. Net Profit: aka “the bottom line” is your total sales revenue minus your total expenses. 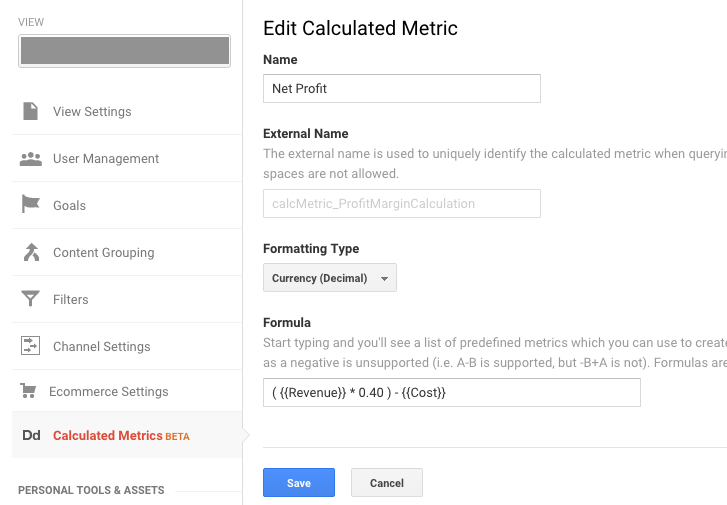 In the example below we will only utilize Ad Cost from Google Analytics in addition to COGS to help get to a close(r) Net Profit number. For this how-to example, I’ll narrow the focus to paid search keywords. This will help us see what keywords perform better than others. Step 3 can also be applied to any other marketing channel, if you have the costs available. 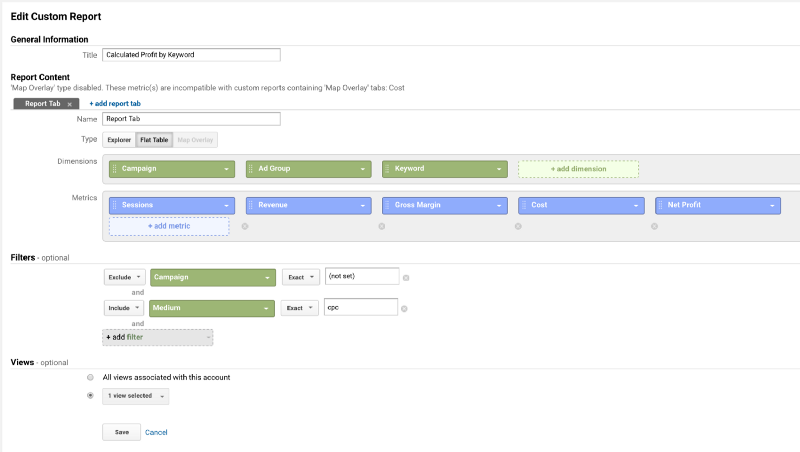 The cost metric assumes you have AdWords already connected to Analytics (which you set up under GA > Property > AdWords Linking) otherwise it will return as $0. To add this report to your own Analytics account you can download this report from the Google Analytics template gallery I have created. 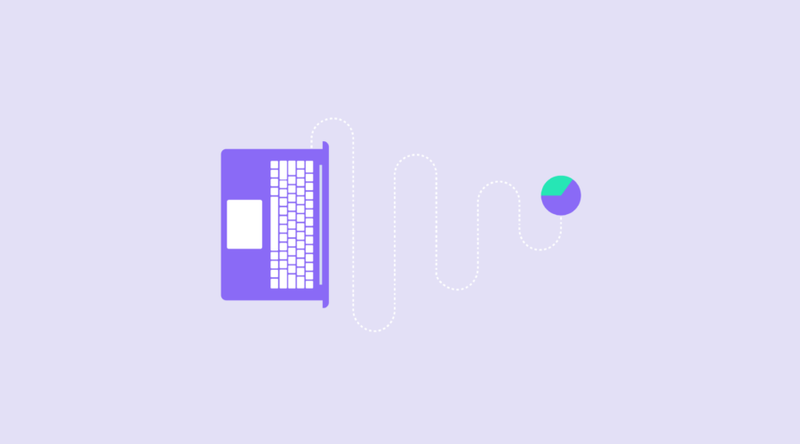 Obviously it’s pretty rare that you’re going to have the same gross margin % for every single SKU, but this is an extremely quick report to help you spot major issues if you have thousands of keywords that could be flying under the radar. Why is gross margin and net profit important? Unlocking this type of data is only the first step — now it’s up to you to take action. Adjust my cpc bid down for keywords that I’m losing money on to reduce my overall cost. Optimize or a/b test landing pages for these keywords if they are underperforming (via revenue per visitor) when compared to other landing pages. Are there bundling or tiered pricing strategies that can be implemented to increase the AOV for a specific brand/keyword? For example — offer reduced price if a user purchases > 3 quantity of a Hanes t-shirt pack. The example report doesn’t display a high net profit keyword, but if it did then you might consider ramping up spend on these keywords that are your unicorns. If you can’t show a profit even after testing/tweaking your strategy for a keyword then it might be beneficial to cut these from paid search spend. While this will reduce your top line revenue #’s, your bottom line margin should improve. What ideas or takeaways do you have in circumstances like these? *If you have a fully functioning Enhanced Ecommerce implementation setup then you can begin reporting on these metrics by individual SKU.